NEW ORLEANS — A crucial non-interference, non-helmet-to-helmet call cost the Saints a spot in the Super Bowl and provided a crushing loss to end the season for a second straight year as the Rams won with a field goal in overtime 26-23. After the game, Saints head coach Sean Payton said the NFL head of officials admitted they had missed the call, saying that it was not only pass interference, but a helmet to helmet hit. If the call had been made, the Saints could have killed the clock and tried a chip shot field goal. “I don’t know if there was ever more obvious pass interference," Payton said. " “It’s frustrating, you know. Just getting off the phone with the league office, they blew the call, there were a lot of opportunities through. But that call makes it first and ten, we’re on our knee three plays, and it’s a game changing call. It’s where it’s at. It’s disappointing." 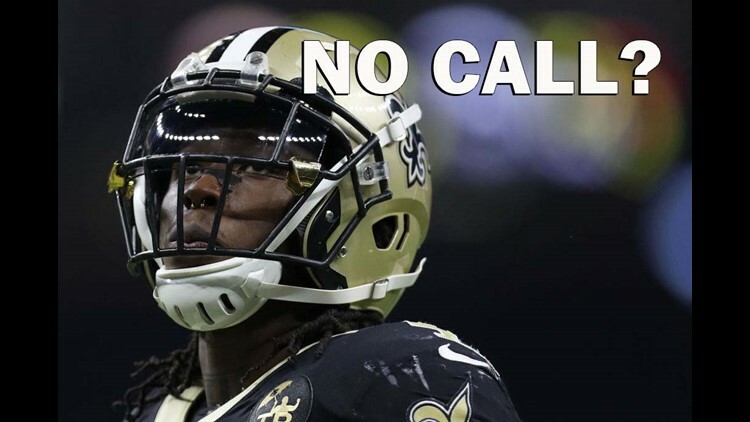 The Saints were so close to clinching a berth in the Super Bowl if either a helmet-to-helmet hit or pass interference had been called, but a no-call kept them from a second trip to the ultimate game. Greg Zuerlein kicked a 57-yard field goal in overtime. On 3rd-and-10 from the Rams 13-yard line following a long pass to Ted Ginn, Tommylee Lewis was targeted by Drew Brees and the Rams' Nickell Robey-Coleman clearly hit Lewis well before the pass got there and with his helmet to Lewis' helmet. But, there was no call. The play was quickly universally criticized by national sports critics, with Peter King calling it the worst 'non-call' of the year. The TV crew also said the same. Sean Payton was livid on the sidelines. People took to Twitter to voice their frustrations, like star wide receiver and commentator Terrell Owens. Sports Illustrated also weighed in. The experts at ProFootballTalk agreed. "Worst no-call of 2018 season," Peter King said. Jordan Rogers said the "refs on that Bird Box challenge again." After the upset, beloved quarterback Drew Brees spoke to the media. "We love the Who Dat Nation. We love the City of New Orleans. We play for them. We love our fans, man, they are awesome, and they were awesome today. Best fans in professional sports," Brees said.